THEY improv provides improv comedy, game shows and murder mystery dinners for entertainment options for a variety of groups and gatherings throughout Florida. This page is designed to assist you in finding your way through our website. This is a site map with links throughout the area. THEY improv continues to change the face of comedy in Florida. 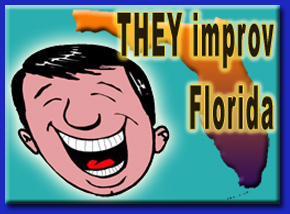 With troupes located in Miami, Fort Lauderdale, the Keys, Fort Myers, Tampa, Orlando, Tallahassee and Jacksonville, THEY improv provides the top improvisational talent of the areas they serve. THEY improv is ready to provide you with a performance experience that won't soon be forgotten. But to do that, they often change the face of their website. That means that sometimes navigating through the website can be more difficult than it should be. This page has been created to help navigate through the website to find the information you are looking for. The site is divided into main sections for each area they serve. Though some of the content is duplicated, it is important to realize the value that each of our sites brings to the table and some subtle differences based on the locations. THEY improv hopes that you will contact them soon to find out how THEY can serve your needs for your next private event, corporate show, company holiday party, interactive game show or Florida murder mystery dinner. Please use these links below to navigate through the Florida sections of our site. We also provide site maps to sections of the website including New York, New England, Florida, California, Southeast US, Mid-Atlantic and Texas. THEY look forward to working with you for your next Florida corporate or private event with a Game Show, Improv Comedy Show or Murder Mystery.